With the loss of venues such as the Capitol Theatre, and the need for a new town hall, Perth’s culture experienced a lift with the opening of the Perth Concert Hall. Radio took a step forward with the introduction of FM stereo broadcasting. 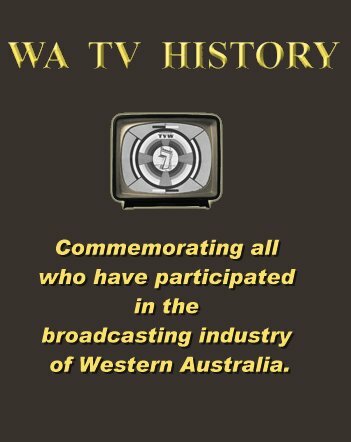 Perth’s third commercial TV station was launched in an era of colour television. NEW Channel 10 is now about to celebrate its 25th Anniversary on May 20, 2013. Digital radio was then introduced in all States and Perth enjoyed new theatre, ballroom and convention facilities with the opening of the Perth Convention and Exhibition Centre and the State Theatre Centre of Western Australia in Northbridge. The Western Australian Academy of Performing Arts (WAAPA) at Edith Cowan University now enjoys international recognition for putting Perth on the world stage with the quality of its graduates. What an accomplishment for the most isolated city in the world, and such a contrast with the battling Swan River Colony, with its limited scope for entertainment. In 1970, the Town Cinema opened in Hay Street, not far from where the Existing Apple Shop is now sited. Will Upson made big band music popular again in Perth during the 1970s. He became musical director of TVW Channel 7 in 1973 and formed the “Will Upson Big Band’ in October of that year, before moving to STW Channel 9 in 1978 as their musical director. The Perth Concert Hall was opened in January 1973 to become a centre for musical performance, with the auditorium featuring a 3000-pipe organ surrounded by a 160-person choir gallery and an audience seating capacity of 1,729. The West Australian Symphony Orchestra performs most of its concerts at the Hall, which has played host to a wide range of internationally acclaimed performers including the London Philharmonic, Chicago Symphony, Israel Philharmonic and contemporary performers B.B. 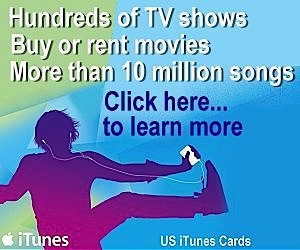 King, Sting, KD Lang, Harry Connick, Jr., Melissa Etheridge, Ray Charles, Rowan Atkinson and Billy Connolly. It has also hosted national and business conventions, school and university graduation ceremonies, exhibitions, award ceremonies and civic functions. All the activities that the 1870 opened Perth Town Hall is too small for. An art deco cinema that opened in 1938, was sold in 1946 to the veteran picture showman Clarence (“Paddy”) Baker, an entrepreneur of the cinema, travelling through the wheat belt areas of the state with his projection equipment, showing movies in the community halls of rural towns. Paddy’s family have been associated with the site since the open air Coliseum Picture Gardens operated behind an elegant two-storey façade on the northwestern corner of Hay Street and Rokeby Road, where the Regal Theatre now stands. The Regal Cinema was converted into a live theatre in 1977 by lessees John Thornton and Stan Bird. 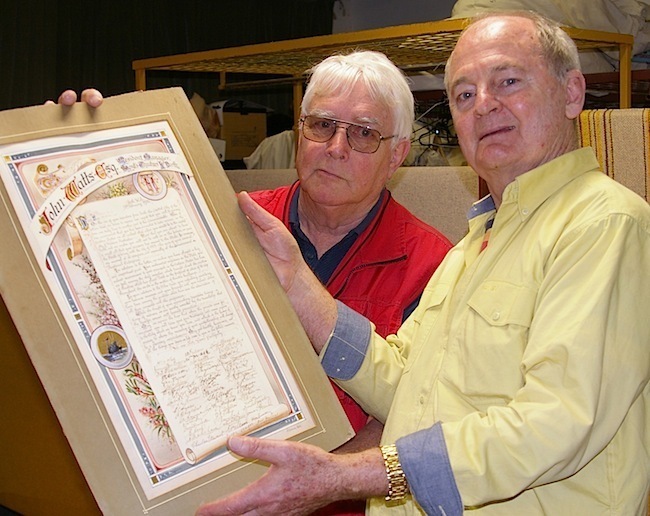 When Paddy died in 1986, he left his beloved theatre to the people of Western Australia. It was John Thornton and Stan Bird who instigated the Baker Theatre Trust, which now owns the Theatre on behalf of the Public of this state. In 1993, the theatre underwent a major redevelopment with a complete rebuilding of the stage. 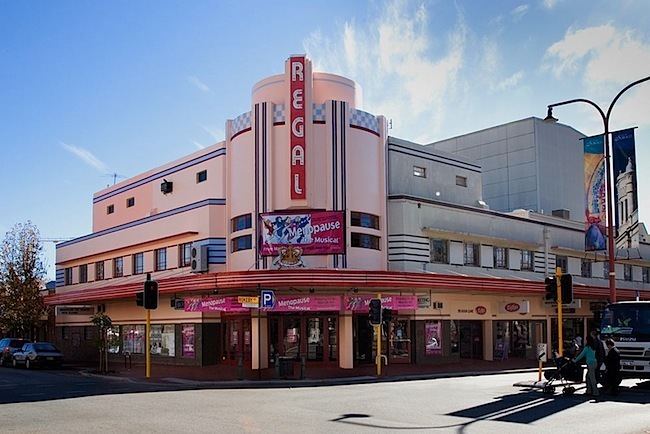 The Regal Theatre is now ideally suited to all forms of theatrical productions including stage shows, concerts, comedies, operas, film festivals and rock shows. 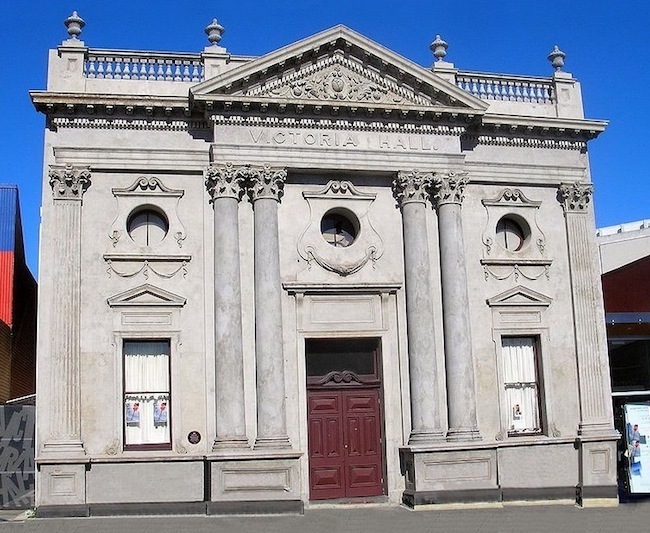 In 1983, Fremantle’s Deckchair Theatre was founded, and was housed at Fremantle’s historic Victoria Hall, at 179 High Street. Across its nearly 30 years, hundreds of Australia’s most talented writers, directors, designers and performers have been brought together in Fremantle to collaborate on the creation of original works. For our ever-evolving audience. Many have gone on to tour far and wide, garnering a swag of awards, including a highly coveted Edinburgh ‘Fringe First’ for Outstanding New Production and most recently a WA Equity Guild Award for Best Director. Its mission is celebrating new Australian writing and telling Western Australian stories. Victoria Hall was built as a parish hall for St John’s Church in 1896 – its name was changed to celebrate Queen Victoria’s diamond jubilee in 1897. Over the years, the venue has been an assembly hall, happy hour club, scout hut, boxing venue, and more. 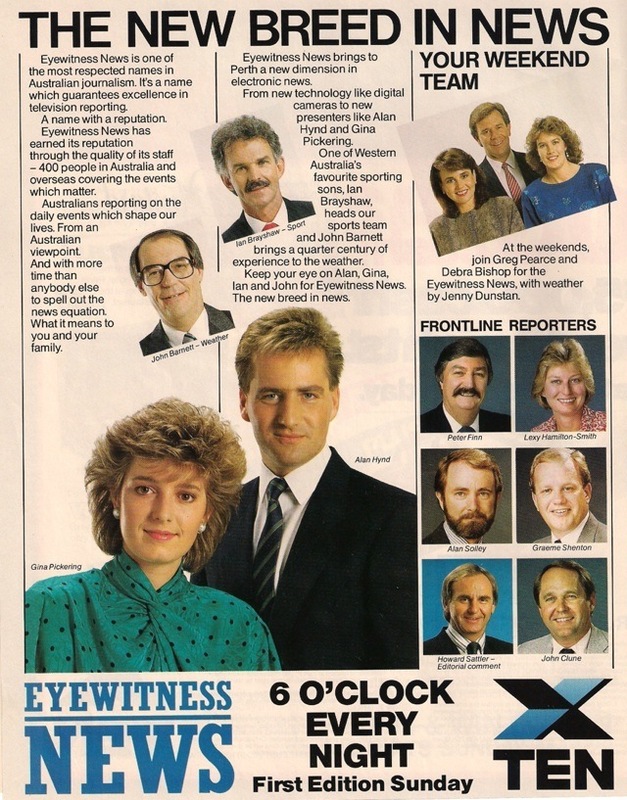 In 1988, NEW Channel 10 Perth opened in Perth. Former TVW co-founder Brian Treasure’s West Coast Telecasters, funded by Kerry Stokes and Jack Bendat, was the successful applicant, though the company was sold to Frank Lowy’s Northern Star Holdings before they went to air, as a result of a change in government policy. A number of key TVW management and staff were involved with the new channel. These included Bill McKenzie (Managing Director), Stuart Joynt (founding News Director), Marion Leyer (Director of Production) and Glenys Gill (Program Manager). Television Station NEW10 Perth was launched at 6pm on Friday 20th May 1988. The station was the first new TV facility in a capital city in 14 years and was the culmination of a substantial legal wrangle that ended the court based TV licence selection system in Australia. 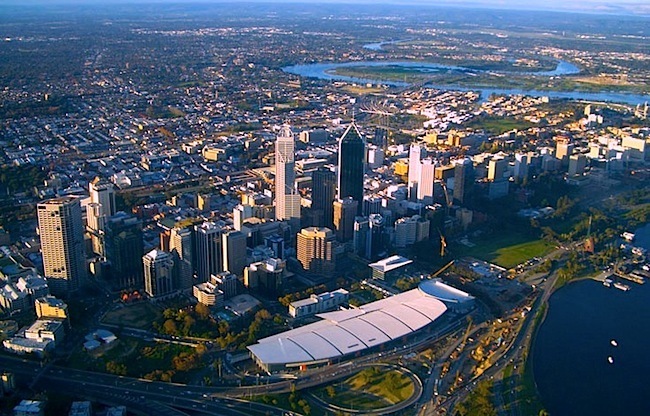 Channels Nine (STW) and Seven (TVW) made a considerable windfall profit by delaying the commencement of a new TV station in “their” Perth market. Before the launch fanfare the station licence owned by Kerry Stokes was sold in conjunction with CTCTV Canberra and ADS10 Adelaide to Network Ten, which subsequently went into liquidation. Network Ten was then picked up by Frank Lowy’s Northern Star Group. Frank Lowy funded the NEW10 Perth startup in new studio facilities at Dianella, and a new transmitter facility at Carmel. NEW10 Perth commenced test pattern transmission from Carmel in February 1988. Northern Star sold Network Ten back to the banks for a $300 million loss in about 1989 then Canadian company Canwest picked it up for a song. Australian Capital Equity in a complex deal with Ten, independently advanced NEW10, ADS10 & CTCTV fortunes until 1995 when Charles Curran returned NEW10 Perth (West Coast Telecasters Ltd) back to Network Ten Australia. Ten news was very successful on NEW10 until the hosts were shifted to read news for Perth to Sydney studios in 1998. This Canwest initiative to save money backfired when discerning Perth viewers went elsewhere. 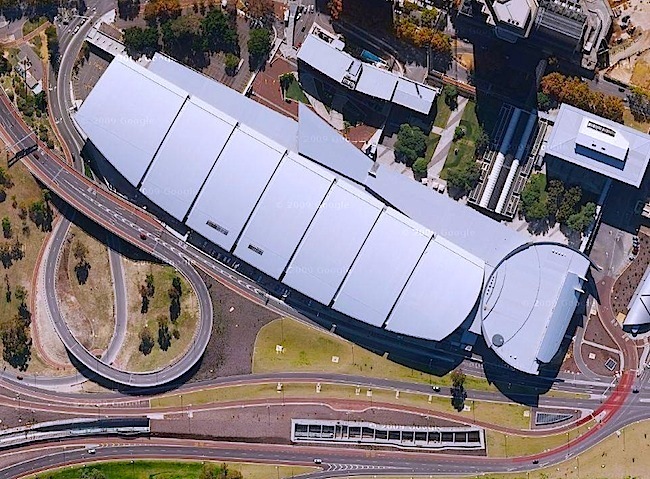 Opened in August 2004, the Perth Convention and Exhibition Centre can cater for functions of up to 5,000 delegates with six exhibition pavilions, a 2,500 seat Riverside Theatre, the BelleVue banquet/ballrooms and 23 specialist meeting rooms. The Perth Convention Centre regularly hosts events of all types. From live music and shows to corporate functions, events and exhibitions. An annual event is the the Channel Seven Perth Telethon, which is regarded as the most successful fundraising event per capita in the world. Fifty six years of 56 years of Amplitude Modulated (AM) wireless was to exist before the more superior Frequency Modulated (FM) stereo broadcasting was introduced to Perth by 96FM. Then Digital Radio entered the scene when the new technology was celebrated by Australian commercial radio and the public service broadcasters on 6th August 2009, when more than 40 different radio stations held a simultaneous outside broadcast in Sydney, Melbourne, Brisbane, Perth and Adelaide. In a world first, Australian commercial radio broadcasters and the public service broadcasters put competition aside on Thursday 6th August 2009 when more than 40 different radio stations held a simultaneous outside broadcast in Sydney, Melbourne, Brisbane, Perth and Adelaide to promote digital radio. 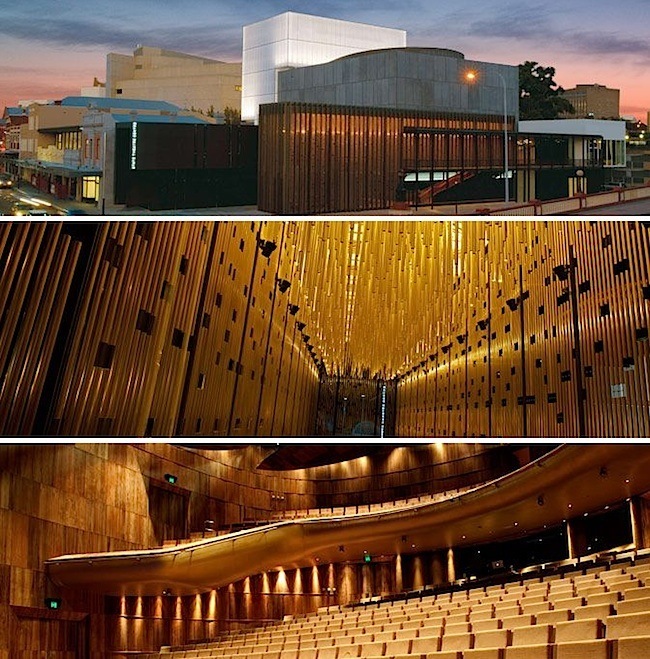 In 2011, Perth’s $91 million State Theatre Centre of Western Australia opened in Northbridge. The centre features the 575 -seat Heath Ledger Theatre and the 200-seat Studio Underground. It also includes The Courtyard, a multi-purpose outdoor events space, two rehearsal rooms and two flexible use private suites. Since the National Theatre Company’s closure in 1984, The Playhouse was home to The Playhouse Theatre Company [1984–85], Western Australian Theatre Company [1985–1991] and Perth Theatre Company [1995 – present], now managed by AEG Ogden (Perth) Pty Ltd on behalf of the Perth Theatre Trust. As of 2010, the Black Swan State Theatre Company and the Perth Theatre Company are the resident companies of the State Theatre Centre, since it opened in January 2011, on the corner of William Street and Roe Street in Northbridge. The wrecker’s ball has now removed the 54-year-old Playhouse from the Perth landscape. 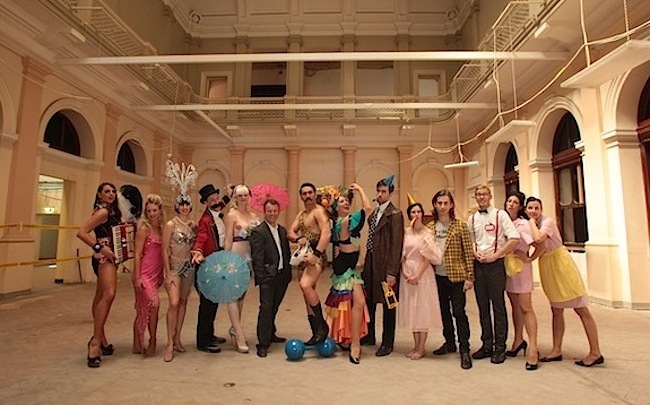 In 2012, one of the features of the Perth Fringe World Festival involved the creation of seven different performance spaces throughout the old Treasury Building and the neighbouring Perth Town Hall. The performances, dubbed the Treasury Cabaret, ranged from burlesque and aerial acrobatics to cabaret, comedy, music and theatre productions. It was the first time in over 15 years, that the historic building was open to the public. The complex of government buildings contained Perth’s first General Post Office (1889) and original Western Australian Treasury Department (1874), Lands Department (1893) and Titles Office (1897). In a few years the site will be permanently transformed as part of a redevelopment of the wider central city precinct. “…a unique blend of classic burlesque and elaborate vintage costumes, with authentic vintage dances, circus, comedy, music and crowd pleasing theatricality! Sugar Blue Burlesque at the Spiegel Tent for the Perth Fringe festival 2011. The festival hosted more than 50 shows with a strong line up of local and national performers over the course of three and a half weeks. The state government contributing $387,000 from the Department of Culture and the Arts and $700,000 from Lotterywest. There were some free shows, whilst others ranged in price from $5 to $40. About 180,000 people attended the festival, buying almost 50,000 tickets for an outlay of nearly $1.1 million. Though our television is largely ignoring the renaissance that is taking place with the performing arts in Perth, it is alive and well in the academies where young artists are prepared for the available national and overseas opportunities. The Western Australian Academy of Performing Arts (WAAPA) at Edith Cowan University is recognised nationally and internationally for the quality of its graduates, and provides a most comprehensive range of training. Students can choose from a number of internationally recognised courses. Theres world-class staff working in state-of-the-art performance and teaching facilities that provide rigorous and specialised training. The WAAPA has an impressive range of production, rehearsal, teaching and performance facilities and services available to support students and there are eight public performance spaces constantly in use for performances and concerts. These include the 270-seat Geoff Gibbs Theatre, the 130-seat Roundhouse Theatre, the 165-seat outdoor Music Auditorium, the Enright Studio, Dance Studios and Jazz Studio all designed for more intimate performances. Our state may be a dominant force economically, but that is not reflected in our television, which is a slave to the eastern states from where virtually all content is broadcast, other than the news. If we can on a per capita basis outperform most other states in producing talent and generating wealth, then one may wonder why our innovation runs out when it comes to originating TV, cinema and theatre content for the national and world stage, rather than Western Australia remain a quarry in more ways than one? In 2001, the Museum of Performing Arts opened at His Majesty’s Theatre to celebrate Western Australia’s rich and colourful entertainment history, following events from the earliest days of the Swan River Colony, through the goldrush to the present, with constantly changing exhibitions of costumes and memorabilia. Thanks to the generous donations every genre of the performing arts can be represented, from music and opera to stand-up comedy. Throughout its colourful and exciting history, His Majesty’s Theatre has hosted a myriad of performance genres – from ballet to contemporary dance, opera to musical theatre, vaudeville to stand-up comedy, Shakespearean drama to pantomime and more. 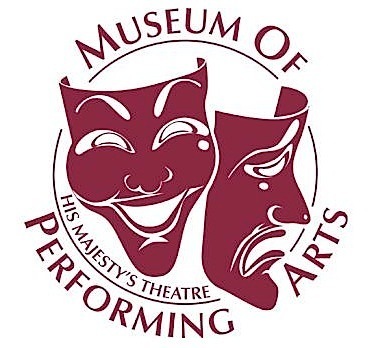 Performers who have graced the stage at ‘The Maj’ include: Dame Nellie Melba, Anna Pavlova, Gladys Moncrieff, Dame Margot Fonteyn and Sir Robert Helpmann, as well as Academy Award winners Katharine Hepburn, Vivien Leigh, Sir John Gielgud, Claudette Colbert, Rex Harrison and Geoffrey Rush.